Hey! 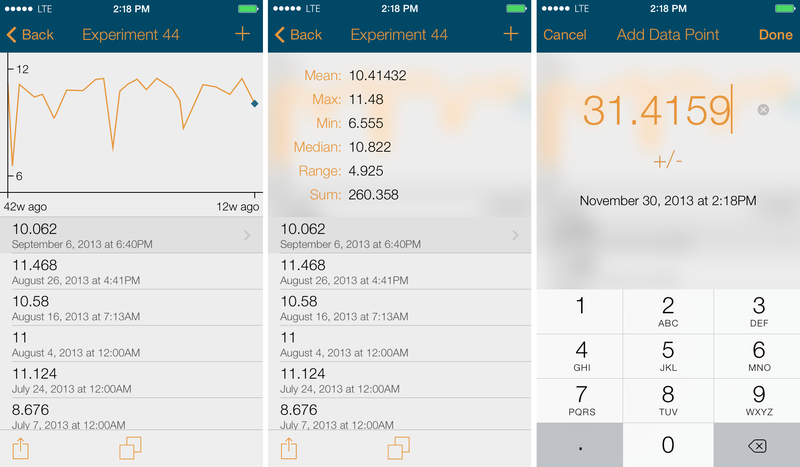 Quantifier is now huge, just like your embiggened iPhone. More pixels means bigger plots and more space to move around your massive, meaty thumbs. Some bugs were squashed along the way, and hopefully new ones were kept out. Reach out with questions or comments on twitter, @QuantifierApp. Comments Off on Version 1.5: The embiggening. There’s a big new update for Quantifier, available now. – Step Tracking. Keep track of your daily step count, taking advantage of the fitness tracking capability of the iPhone 5S. – A plot’s time scale can be adjusted to look at specific time periods (e.g. just the last week, just the last month, etc.). This will give you clearer view of recent changes in comparison to all of the data. This is particularly useful for larger data sets or those that extend over long periods of time. – You can now edit the date and time associated with existing data points. – 64-bit support on the iPhone 5S. If you like the app, please leave a review in the App Store. I’ll never pester you in the app to rate it. 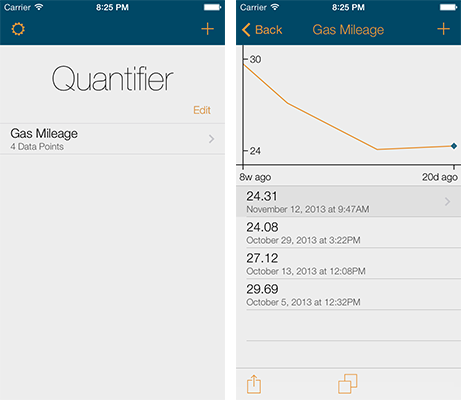 In version 1.3, Quantifier can take advantage of the fitness tracking capability of the iPhone 5S. This allows you to track the number of step you have taken each day, and use Quantifier’s plotting and statistics capabilities to learn more about your habits. Simply go into Settings and flip the switch to enable Step Tracking. If you don’t see a switch, this means that you don’t have a new enough iPhone to take advantage of this feature. Throughout the day, when you open up the Steps quantifier, you will see the current day’s step count, updated automatically. If you walk while you have this plot visible, you can pull to refresh the step count. There is no need to manually add data, so that is disabled. If you have an existing log of your step data, simply create a csv file called “Steps.csv” and import it into Quantifier as described in a previous blog post. Quantifier will enable daily step tracking and will add to your existing dataset. One new feature in version 1.2 is the ability to create new Quantifiers with pre-existing data sets. For example, if you have been keeping track of your car’s gas mileage in a spreadsheet or on paper and would like to migrate to the app, it’s now possible. What you’ll need to do is generate a .csv (comma-separated values) file with your data set (here’s a good simple guide on how to do this with a few common applications). The file name should have no spaces (” “), but instead use underscores (“_”). This requirement will go away in the next version. All values should be positive or zero. Avoid extraneous characters, spaces, empty lines, etc. Once you have made this file, ensure that you have linked the app with Dropbox via the Settings menu. If you don’t have a Dropbox account, you can make one within the app, or you can sign up here. On your computer, navigate to Quantifier’s folder in your Dropbox. This is found at Dropbox\Apps\Quantifier. Drop your new .csv file there. Give it a moment to sync. 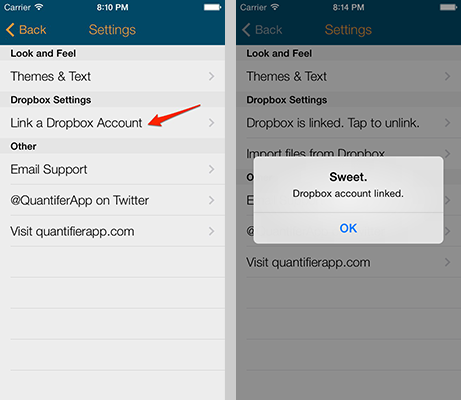 Head back to Quantifier’s Settings, and tap “Import files from Dropbox”. After a second of going to space and back, cauldron stirring, and other assorted sorcery, the data set will be imported. It’s ready to update with new data, and changes will automatically be reflected in the file in your Dropbox. Magic! Now go start collecting data! Get in touch with me with any questions, suggestions, haikus, or fart jokes you may have on twitter (@QuantifierApp) or at dev@quantifierapp.com. It’s a big update this time around! What will jump out at you first is the new logo and default theme. There is also a new summary view within each Quantifier that shows you some basic statistics on the dataset. 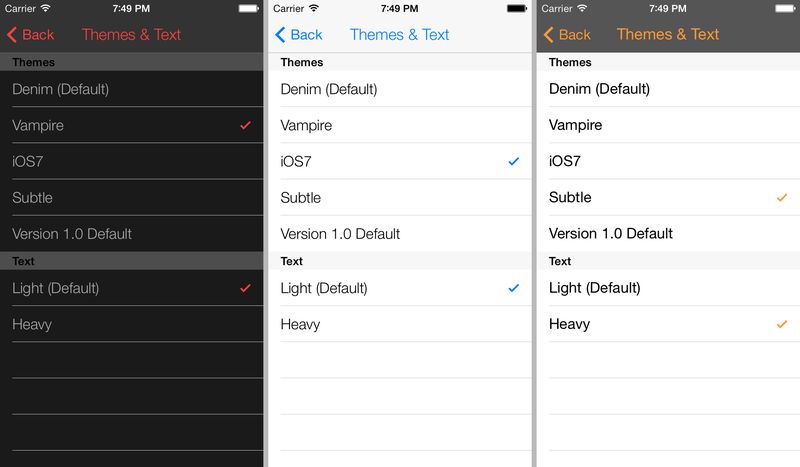 In addition to the default theme, there are some other options which are available in the Settings (alongside a new text weight option). The new, more user-friendly settings screen has a few new options, including “Import files from Dropbox”, which I will write about a bit more in an upcoming post. Enjoy! Let me know what you think via twitter (@QuantifierApp) or at dev@quantifierapp.com. Quantifier is now for sale. Get it while it’s hot!